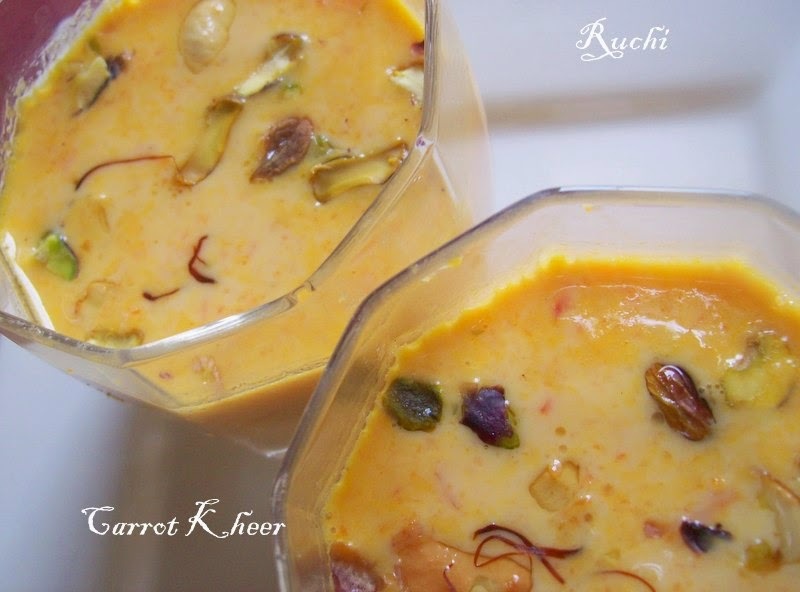 Carrot kheer is a nutritious and delicious Indian dessert that can be easily made at home. The addition of milk and carrots makes this dessert very nutritious. 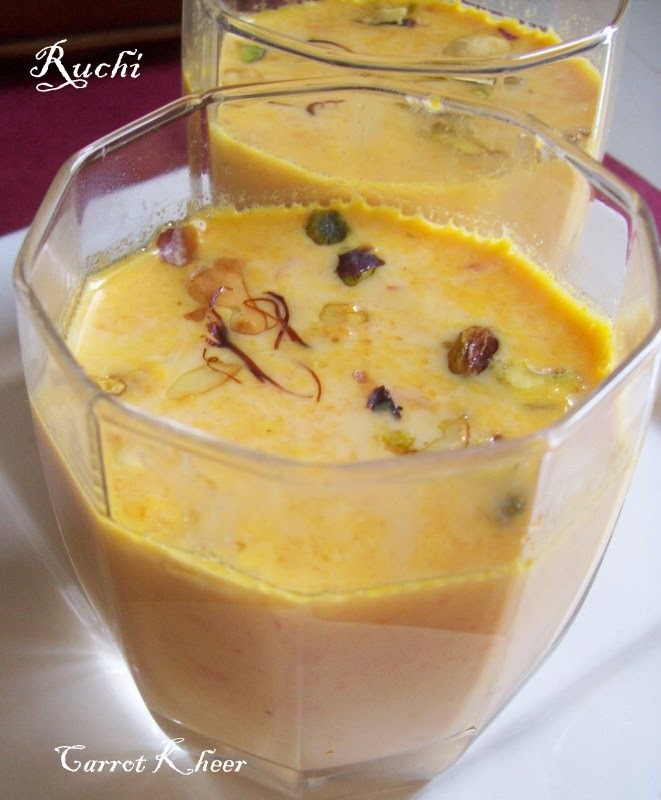 The milk gets richer and creamier and combines with the carrot purée bringing out a sweet and delightful dish. It is very simple to make and it is quite a relishing treat both children and adults will love it. 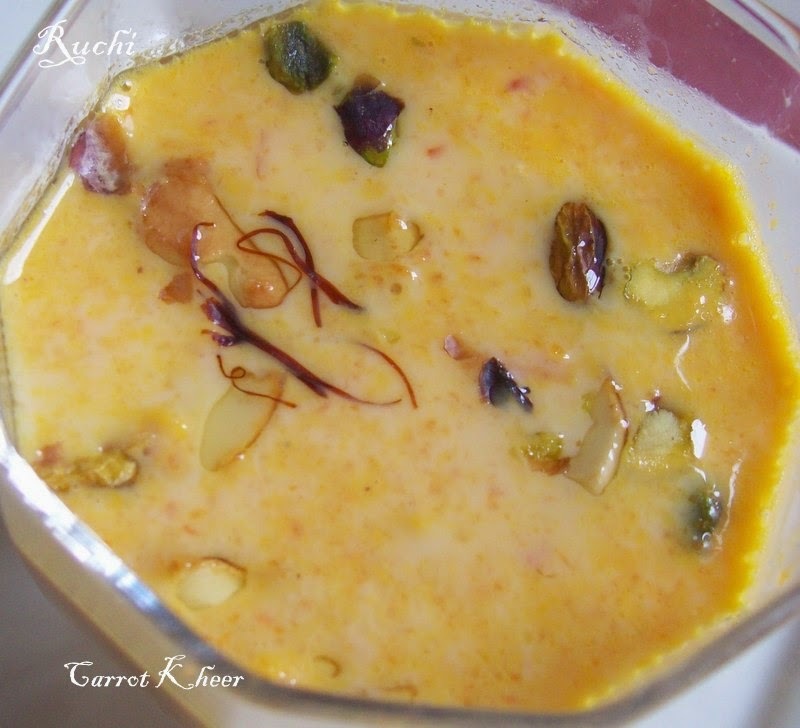 This kheer can be enjoyed either hot or cold.This dessert is my family's favorite dish. 1.Heat ghee in a thick bottomed pan and roast the nuts to golden and remove. Add the raisins and fry them just until they swell up a bit and remove. 2.Then add the grated carrots to the same ghee and roast it on a slow flame till the raw smell goes. Keep aside. 4.Add Carrots to the milk and cook till until it thickens and keep stirring till it reduces a little in volume. 5.Allow the mixture to cool slightly and then add it to a blender. Finely grind the carrot and nut mixture until it is a thin paste. 6.the carrot paste, the rest of the milk, and the sugar, condensed milk to a saucepan. Slowly boil the mixture for 5 minutes, stirring continuously to avoid lumps. 7.Simmer for another 10minutes. Then add the roasted cashewnuts & raisins, bring the mixture to a boil and switch off the flame. Finally, add the cardamon powder and mix well. ! 8.If the consistency is bit solid add some milk! Garnished with the finely chopped pistachios and a few saffron strands.